When your Samsung Galaxy S5 or Samsung Galaxy S6 phone takes a nasty fall or gets submerged in lakewater, or your Samsung Galaxy S7 gets caught in a boot loop that you can’t break out of, Gillware can help you get the data from your phone back. Whether you need photos, text messages, your contacts list, or any other kind of data recovered, our engineers are your best hope. Our smartphones are some of the most important things we own. What would we do without them? When you smash your phone’s screen or it gets stuck in a boot loop, suddenly you can’t make calls or send texts, let alone receive them; you can’t take photos or videos; you don’t have a mobile web browser or social media apps for on-the-go access anymore; you probably don’t even have a portable music player to fall back on! You’ve become stranded on a digital desert island. You need your phone repaired so you can get back in-step with modern society. When Does Samsung Data Recovery Software Work? What's the difference between phone repair and phone data recovery? When it comes to smartphones, every Samsung Galaxy S6 is interchangeable. The only thing that makes the Samsung Galaxy S5 smartphone in your pocket different from the one in anybody else’s pocket is what you put on it. When you lose the photos, text messages, contacts, or any other data on your phone, you lose what makes your phone unique. That data can’t be replaced like your phone’s screen can–and that’s where Gillware comes in. Samsung data recovery software can help you recover deleted text messages from a Samsung Galaxy, as well as other kinds of deleted data such as photos and contacts. If your phone has a broken screen and you cannot access it normally, you can sometimes use data recovery software to pull data off of your phone and keep it safe until you get your phone fixed. Samsung data recovery software tools work best when your phone is still mostly functional and as long as you are careful in how you use it. If you have a functional phone that you’ve deleted data from, you need to turn off Wi-Fi and turn on airplane mode, connect your phone to your computer, and use Samsung data recovery software on your computer to recover the data from your phone. When Do I Need Samsung Data Recovery Experts? 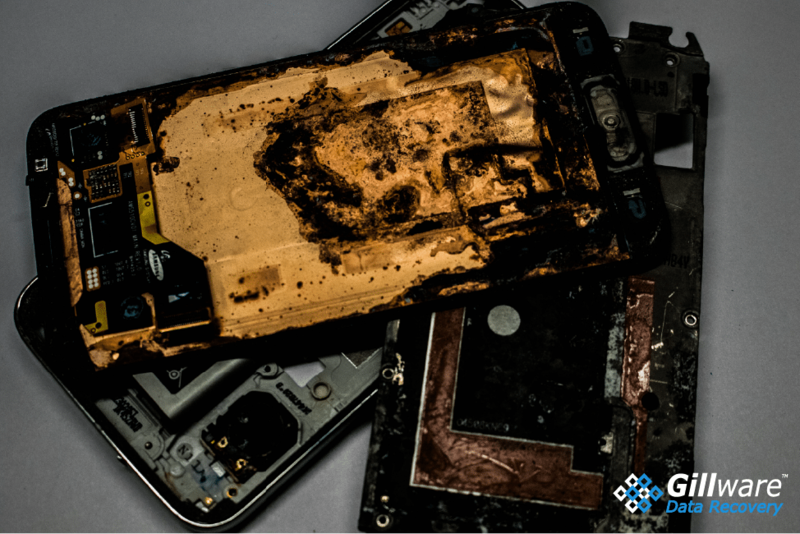 Even if your phone looks like this, our engineers can still recover data from it. If your Samsung Galaxy S5 or S6 smartphone is broken beyond repair, you’ve come to the right place. If none of the software you’ve tried has managed to find the contacts you’ve accidentally deleted, you’ve come to the right place. If your Samsung Galaxy S7 is stuck in a boot loop and you need to retrieve the files from it, you’ve come to the right place. Gillware has been recovering data for tens of thousands of people per year for over 15 years. The engineers at Gillware have tens of thousands of hours of hands-on experience recovering data from phones of all makes and models. We use cutting-edge tools, including data recovery software specially developed for our engineers, by our engineers, and forensic analysis software in our professional data recovery lab in Madison, Wisconsin. These are only a few of the issues we solve in our data recovery lab on a daily basis. Your Samsung Galaxy smartphone has two locations in which it stores your data: a removable microSD card and an eMMC chip on the phone’s internal logic board. The removable SD card is easy to access, and if you’ve lost data from it, our engineers have plenty of tools to retrieve it. When your phone has suffered from an issue such as water damage, our engineers will usually only need to do some clean-up work to your phone’s innards to get the phone in working order and salvage data from it. If your phone is very badly damaged, though, its internal eMMC chip will need to be removed. 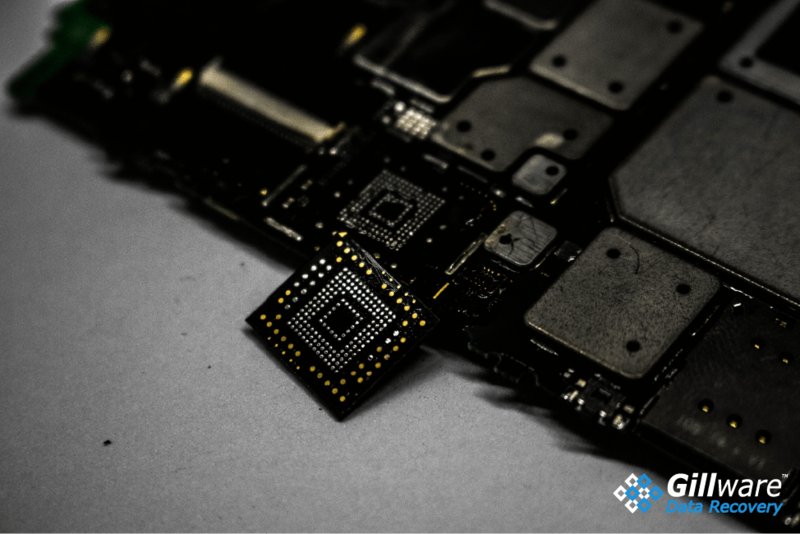 When a broken smartphone is not encrypted, as it is Samsung Galaxy S6 and earlier models, its eMMC chip can easily be removed from the logic board and placed in a specialized chip reader, and our data recovery software can handle it from there, imaging and analyzing the chip’s data under the skillful guiding hand of one of our technicians. That said, removing the eMMC chip for a Samsung Galaxy data recovery case is still a tall order. These chips are, obviously, not meant to be removed and are connected by a strong epoxy resin to the phone’s logic board. Both of these methods require special skill and special tools, especially the first method. It’s easy for things to go wrong if the grinding is uneven (though it can produce some beautiful works of art). It is because this type of work is required for recovering data from smartphones that entrusting your data to a professional lab is so important. However, this process is comparatively simple compared to what Samsung Galaxy data recovery technicians must do when encryption is thrown into the mix. In a world where privacy seems to be a scarcer and scarcer resource with each passing day, we take solace knowing that powerful encryption is keeping at least some parts of our lives safe from prying eyes. As the need for strong data encryption has risen, so too has the demand for encryption as a default setting on our devices instead of a choice we must opt-into. Around when the Samsung Galaxy S7 launched in 2016, the trend of encryption firmly swung to the position of encryption by default, in which there is no opt-in or opt-out for encryption. All forthcoming Samsung Galaxy models are encrypted by default, creating new hurdles for data recovery engineers to clear. For modern Samsung Galaxy phones, encryption is placed on the phone’s internal chip by default, and the key to the encryption is linked to whatever the user sets to access their phone–a four-digit PIN, for example. As a result, simply removing the chip from the phone and placing it inside the specialized adapter yields only encrypted data, which looks like utter gibberish, and no way to perform the task that matches the encryption key. Instead, Samsung Galaxy S7 or S8 data recovery requires much more intensive work when the phone in question is broken. Instead of just removing the eMMC chip, our engineers must transplant it to a functional logic board from the same model of phone and rebuild the phone around it. Once the old phone’s internal memory has been housed in the new “Frankenphone,” we can access the data on it with the user’s credentials and recover data from the phone. We call this process “chip-on” data recovery, as opposed to “chip-off” data recovery since the chip has to go back on after we take it off. 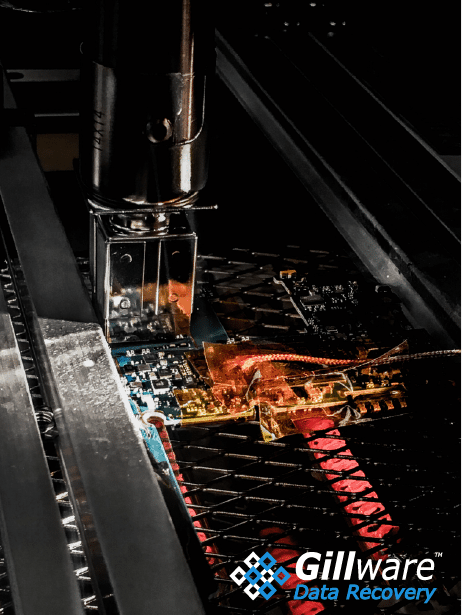 As one can imagine, a chip-on procedure is extremely labor-intensive, resulting in many more hours of effort from our engineers. It also requires a greater investment in materials. Often our engineers must acquire an entirely new phone of the exact same make and model in order to use its parts to create a working “Frankenphone” with the chip from the damaged phone. Gillware’s mission is always to make data recovery as financially risk-free as possible. That’s why we offer free inbound shipping to our lab in Madison, WI, and free evaluations with no upfront fees or cancellation charges, why we make sure our customers always understand exactly how much their case will cost before we do any data recovery work, and why we only charge for the labor associated with data recovery once we’ve successfully met the customer’s goals and recovered the data that’s important to them. However, sometimes when our engineers need to order new phones as donor parts, the cost of a new phone must be added to the cost of data recovery as an upfront deposit. Why Choose Gillware for Samsung Data Recovery? Gillware’s in-lab data recovery services are affordably priced, technologically innovative and completely secure. There’s no need to feel anxious about the data you’ve lost. We’re with you every step of the way and will do everything in our power to get your data back at a cost that makes sense to you. Gillware’s professional data recovery lab has the tools and expertise you won’t find anywhere else. If you need data recovered from a Samsung Galaxy phone for purposes of civil or criminal litigation, contact Gillware’s mobile forensics experts.